Trust Collins for Your HVAC Repair, Installation, & Maintenance Needs. 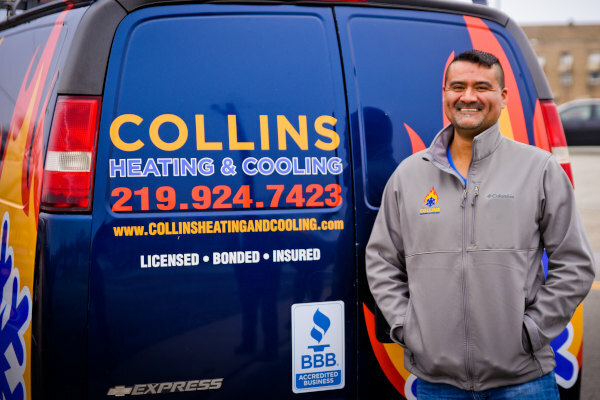 At Collins Heating & Cooling we have more than 14 years’ experience serving the residents of Dyer, Indiana. Our reputation as a reliable, honest and professional HVAC Company motivates us to do our best for every customer. 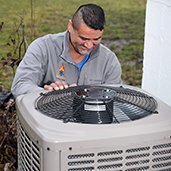 Whether you have been having issues with your heating system and need a furnace repair, your cooling system has been acting up and you need a free estimate on a air conditioner replacement, or simply want to schedule preventative maintenance, our team of top-rated heating and air conditioning professionals are available to help. We pride ourselves on our integrity and our dedication to doing what’s right for the customer, we never up-sell or use high pressure sales tactics. Instead, after a careful assessment of your HVAC issue we provide you with an easy to understand explanation of the problem, the potential solutions, and the advantages and disadvantages of each. Call us today at (219) 924-7423 Or Request Service online and enjoy professional heating and air conditioning repair, installation, and replacement solutions for your home in Dyer, Indiana. No surprises, and no hidden fees. We always clean up after ourselves! We are a fully licensed, bonded & insured. We answer all your questions & provide honest recommendations. Mark is an awesome dude. Very friendly, explains everything. I trusted him right away. He just gave that feeling. He came highly recommended by my neighbors and didn’t disappoint. Very happy with my new equipment and reasonably priced. I was very pleased. Mark attempted to get my very old ac unit running but the compressor was locked up. After that, he explained the various options in equipment that I could select from (different grades). After selecting what I was the most comfortable with, Mark sent me a written quote and Certificate of Liability insurance. I accepted the quote and he did the rest, including getting the permit from the city. He switched his schedule around to accommodate a Saturday install, and was very careful, bringing a tarp as well as shoe covers to ensure no tracking into the home. I’m very pleased with Mark’s work. Mark is the BEST!! Very friendly and honest. He explains everything thoroughly and is very reasonably priced too. He will also go out of his way for you to get a job done. You were very prompt, thorough, and patient with all of our questioning. You were also very personable which made working with you even easier and more enjoyable. Thank you! Is It Time to Repair or Replace Your Furnace? Winters in Dyer go from mild to extreme cold. So, at Collins we always suggest you turn on your heating system in early fall and look for any potential problems. It’s much better to detect a small problem before it becomes an emergency furnace repair. We don’t want anyone to find themselves in this stressful situation so here are a few things you can check for early in the season. FOUL ODOR: A furnace or heating system gathers dust just like any other system that circulates air through your home. If you notice an odor coming from your heating ducts that smells like burning dust, or smoke when you initially turn on your furnace, this is normally caused by dust on the heater exchanger that has gathered over the summer months. If this smell goes away fairly quickly you are O.K. If it’s persistent, you smell burning plastic, or gas this could be a mechanical problem occurring before a major breakdown. 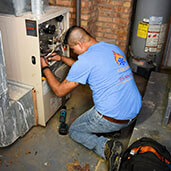 Give us a call and one of our expert techs can inspect your system and quickly identify and resolve any heating issue. HIGH ENERGY COSTS: We’re all pretty familiar with our average heating costs per month. If you notice that your NIPSCO bill suddenly spikes without any change in your energy habits, it might be due to an aging unit that needs to work harder to reach the set temperature or you may just need annual furnace maintenance. POOR TEMPERATURE CONTROL: If you notice that your furnace is struggling to heat to the temperature you normally set, your unit is past it’s warranty, or you have had increasing repairs needed. It’s probably time to consider installing a new furnace. We never recommend a replacement unless it’s a benefit to the customer. LOUD NOISES: Any strange or out of ordinary sounds such as knocking, grinding, banging, rattling, and rumbling are pretty clear signs that your heating system isn’t working as well as it should. A rattling or knocking sounds can be something as simple as a loose panel or screw or a sign of a more serious mechanical problem. If you notice any of these signs give us a call and we will inspect your system and quickly track down the issue. Older systems can be fixed and repaired, and we always lean towards a repair option first, as long as we believe it’s in the best interest of the customer. As time goes on and your unit runs out of its warranty, it will become costlier to fix after every breakdown. When this time comes you can trust us to recommend an efficient, reliable furnace unit that will be sized correctly for your home. For superior heating installation and service in Dyer, contact us at (219) 924-7423 or use our online form. We all know summers in Northwest Indiana can go from comfortable to unbearably hot & humid on a days notice. When that summer switch is finally flipped and the heat wave arrives your air conditioner is working hard to keep you & your family cool and comfortable. As you can imagine this is when we receive the most AC Repair calls at Collins. For that reason we always suggest you turn on your cooling system in the spring to check if you find any warning signs you may need to have your AC unit serviced. Here are a few things to look out for which often indicate that a problem is present with your cooling system. No Cool Air: This could be a sign of a bad compressor, low refrigerant or a leak. Thermostat Problems: Many times, you could have a faulty thermostat causing your cooling issue. You may notice that the temperature feels off or your unit just does not turn on. Loud Sounds: Air conditioning systems are designed to be fairly quite overall. When you experience loud sounds from your outside unit including, squealing, clanking, banging, buzzing, or chattering we suggest you turn off your central air conditioner unit as a precaution until it can be inspected thoroughly. Bad Smells: When your air conditioner starts to give off strange odors it can be caused by a variety of things. If you have a musty dirty sock type smell you may have an issue with dust and moisture sticking on your a/c evaporator coil & filter. A Moldy mildew type odor coming from your air conditioner might be a clogged condensate drain line. Burning or plastic type smells can be a sign of some electrical issues. Increased Electric Bill: HVAC consumes the largest amount of energy in your home. If you notice a large spike in costs since last season it’s a good idea to have your system inspected. Water Near AC Unit: If you notice water pooling around your air conditioner you may have a refrigerant leak or an issue with the evaporate coil. Give Us a call today at (219) 924-7423 or Request Service online and we will perform a detailed inspection, identify any signs of wear and tear, and repair or replace necessary parts to keep your air conditioning running smoothly. Why Trust Your Air Conditioning Installation to Collins? Living in Northwest Indiana we all depend heavily on our air conditioners to keep us cool and comfortable. This makes replacing an old unit a high priority, especially when summer is at its peak. At Collins you can trust our qualified HVAC experts to provide you with honest recommendations designed around your specific needs. We are a registered Armstrong Air dealer in Dyer Indiana and we provide efficient A/C units which are backed by a 10-year Limited Warranty on the compressor and 10-year Limited Warranty on parts. When we arrive at your home or office, we will look over your current system to ensure that you need to replace your unit. If you do, we will provide you with options that best fit your needs and budget. 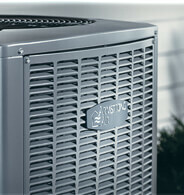 Why Choose An Armstrong Air Conditioner? If you are in Dyer Indiana and looking for an HVAC contractor to replace an old air conditioner or install a central air system, trust in our Collins Heating & Cooling team to deliver quality guidance and integrity in the installation process. Winters in Dyer go from mild to extremely cold. So, at Collins we always suggest you turn on your heating system in early fall, because it’s much better to detect a small issue before it becomes an emergency furnace repair. We don’t want anyone to find themselves in this stressful situation. Here are a few common problems that you may run into with your heating system. FOUL ODOR: Your HVAC system gathers dust as it circulates air through your home. If you notice an odor coming from your ducts that smells like burning dust, or smoke when you initially turn on your furnace, this is normally caused by dust that has settled on the heat exchanger over the summer months. If this smell goes away fairly quickly and you’re O.K. However, if the burning smell is persistent, you smell burning plastic, or gas this could be a mechanical problem occurring before a major breakdown. HIGH ENERGY COSTS: We’re all pretty familiar with our average heating costs per month. If you notice that your NIPSCO bill suddenly spikes without any change in your energy habits, it might be due to an aging inefficient unit or it could be a sign that your furnace needs maintenance service. POOR TEMPERATURE CONTROL: If you notice that your furnace is struggling to heat to the temperature you set there can be many causes. Including poor insulation, leaky ductwork, faulty thermostat, an improperly sized furnace and more. If you run into this issue just contact us and we can track down the issue and offer solutions. LOUD NOISES: Any strange or out of ordinary sounds such as knocking, grinding, banging, rattling, whistling and rumbling are pretty clear signs that your heating system isn’t working as well as it should. A rattling or knocking sound can be something as simple as a loose panel or screw or a sign of a more serious mechanical problem. Older heaters can be fixed and repaired and we always lean towards a repair option first. As time goes on and your unit runs out of its warranty, it will become costlier to fix after every breakdown. When the time comes you can trust us to recommend an efficient, reliable furnace unit that will be sized correctly for your home. If you need heating system repairs In Dyer Call us at (219)-924-7423 or Request an appointment online today! We all know summers in Northwest Indiana can go from comfortable to unbearably hot & humid on a days notice. When that summer switch is finally flipped, and the heat wave arrives your air conditioner is working hard to keep you & your family cool and comfortable. As you can imagine, this is when we receive the most AC Repair calls at Collins. For that reason we always suggest you turn on your cooling system in the spring to detect any warning signs you may need to have your AC unit serviced. Warning signs which often indicate a problem with your air conditioner. Poor Air Flow: If you notice that your central AC is not blowing very hard you may have an issue with your blower motor. Thermostat Problems: A faulty thermostat can be the cause of many problems. You may notice that the temperature feels off or your unit may not be turning on. *Tip always check to make sure you have batteries in your thermostat and it’s set to ‘cool’. It’s also a good idea to check your circuit breaker. Loud Sounds: Air conditioning systems are designed to be fairly quite. When you experience loud sounds from your outside unit including, squealing, clanking, banging, buzzing, or chattering we suggest you turn off your central air conditioner unit as a precaution until it can be inspected thoroughly. Increased Electric Bill: Heating & cooling consumes the largest amount of energy in your home. If you notice a larger spike in costs since last season it’s a good indication you should have your system inspected. Living in Northwest Indiana we all depend heavily on our air conditioners to keep us cool and comfortable. This makes replacing an old inefficient unit a high priority, especially when summer is at its peak. You can trust our qualified HVAC experts to provide you with honest recommendations designed around your specific needs. We are a registered Armstrong Air dealer and we provide efficient A/C units which are backed by a 10-year Limited Warranty on the compressor and 10-year Limited Warranty on parts. When we arrive at your home or office, we will look over your current system to ensure that you need to replace your unit. If you do, we will provide you with options that best fit your needs and budget. Highland, Griffith, Munster, Hammond, Schererville, Dyer, St. John and surrounding Northwest, Indiana area.